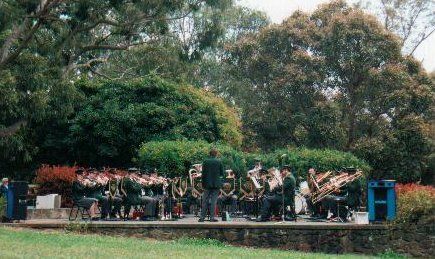 The Melbourne Tramways Band's free public recitals at Wattle Park in Melbourne's eastern suburbs, represent a tradition nearly rivaling the history of the park itself. The band commenced its regular concerts in November 1940 and the annual seasons of monthly concerts (September to April) have continued unbroken for seventy-two years. Relatively few of Melbourne's residents realize that within the long established suburban area bounded by Box Hill, Camberwell and Burwood is situated this huge leafy oasis of some 56 hectares (137 acres). The park was established as a pleasure park by the Hawthorn Tramways Trust in 1917 with the aim of encouraging Melbourne's public to travel by tram to the service's eastern terminus at Warrigal Road, which at the time represented the city's outer fringe. The major building in the park is the Chalet built in 1928, which is a replica of a particular Bavarian chalet. It's interesting for visitors to note that the building, like most structures in the park, was built almost entirely from used materials salvaged from various tramway establishments. In recognition of its unique history the entire park has been included on the National Estate Register and is classified by the National Trust. In addition, one third of the park, including the Chalet and the bandstand, is registered by the Historic Buildings Council. These registrations guarantee that development within the park will compliment its immense period charm. 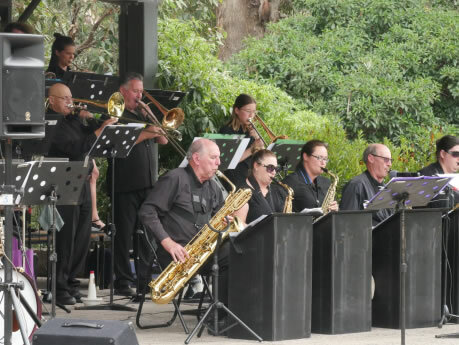 Despite the transfer of the management of Wattle Park from the Public Transport Corporation to Parks Victoria in 1991, the Melbourne Tramways Band has continued to present its concerts, thereby maintaining a valuable link with the park's tramway origins. The band was delighted, when Yarra Trams undertook to sponsor the concerts as part of the group’s commitment to the people of Melbourne. Without the sponsorship of Yarra Trams and the support of Parks Victoria, this great tradition would have ceased.